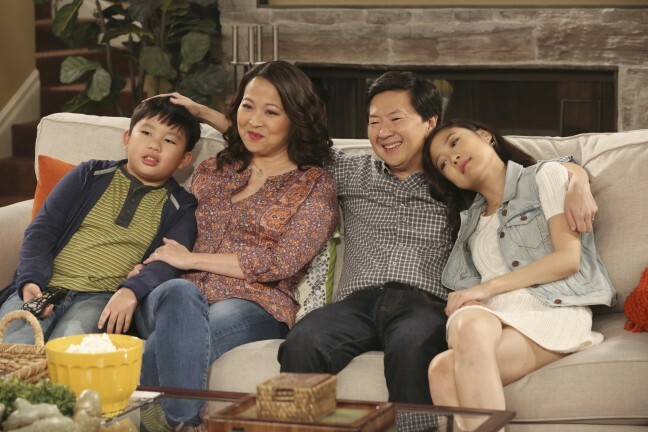 The Huang kids in "Fresh Off the Boat." Photo courtesy ABC/Ron Tom. A list of past and new faces of Asian Americans who portrayed children or teens on mainstream TV. 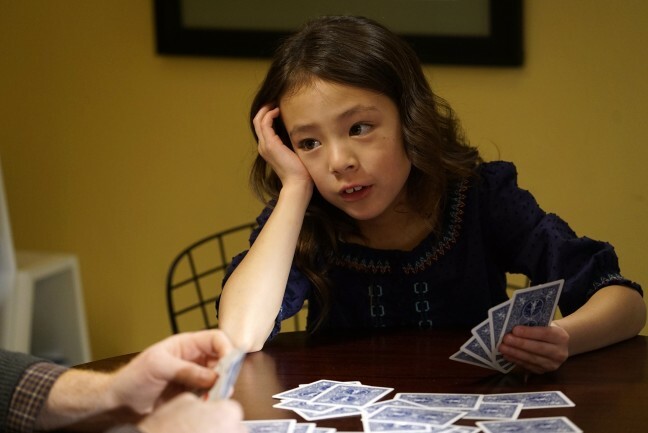 The Fall 2015 television lineup features an unprecedented number of Asian American kids onscreen. While Asian American child actors have graced the big and small screens for decades, often their characters have fallen into the well-worn stereotypes of nerdy sidekick or martial arts master. Some personas, such as Short Round from Indiana Jones and the Temple of Doom or Long Duk Dong of Sixteen Candles infamy, have been portrayed as heavily accented or foreign. And still other young performers of Asian American descent have found success playing roles that didn’t reflect their ethnicity, such as Nia Peeples in Fame during the 1980s, or Mark-Paul Gosselaar in Saved by the Bell or Kristin Kreuk in Smallville, to mention a few from the1990s. 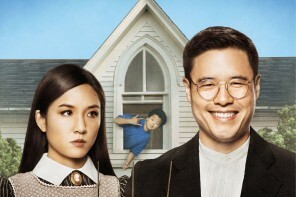 This year, primetime shows Fresh Off the Boat and Dr. Ken have added both numbers and increasingly complex Asian American child or teen characters. Here’s a look at APA youth on TV shows, past and present. 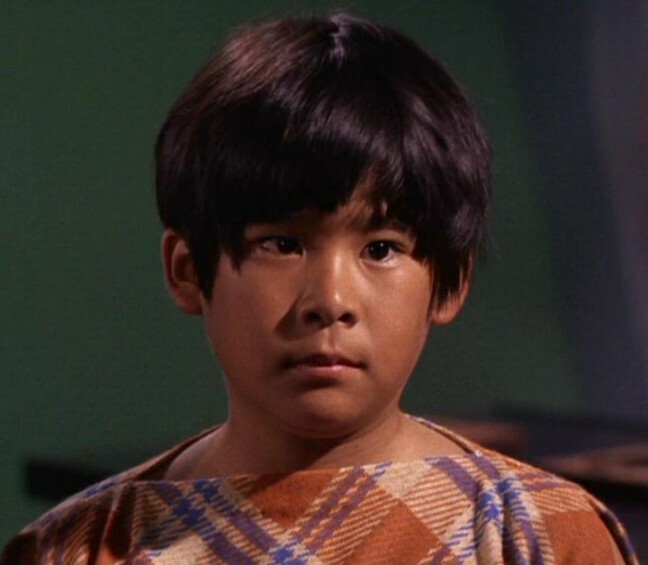 Brian Tochi as Ray In the original “Star Trek” series. After a childhood as a commercial actor and guest turns on shows such as Star Trek, The Brady Bunch and The Partridge Family, 14-year-old Tochi was cast as one of the leads in Space Academy, a CBS Saturday morning sci-fi program set in the year 3732. In 1977, Tochi played Tee Gar Soom, a space cadet and doctor-in-training with feathered hair and superhuman strength. In a one-season (1986-7) ABC spinoff of the Disney movie The Last Electric Knight, Reyes played Ernie Lee, a young boy from a family of martial arts experts from a mythical Southeast Asian country. Guided by his sage grandfather,a policeman becomes Ernie’s tutor, and the boy unwittingly puts his own powers to work stopping bullies and fighting crime. With a voice oversized for her tiny body, 10-year-old Lew sang and danced, playing herself during the 1987-88 season of the syndicated live action musical show which interspersed performances by the members of a young rock band with moral lessons about common schoolyard dilemmas. Five years before Tricia Joe played the role of Claudia Kishi in the big screen version of The Baby-Sitters Club, Jeni Winslow played the artistic (and math-challenged) Claudia in a TV version of the popular book series that ran for just one season in 1990. A few episodes even centered around Claudia’s adventures and also featured Jane Chen as Claudia’s bookish math-whiz sister, Janine. The Power Rangers proved to be an enduring series, having various series, on and off, from 1993 through 2012. Thuy Trang played Trini Kwan, better known as the Yellow Power Ranger, in the original 1990s Fox series The Mighty Morphin Power Rangers (Trang tragically died in a car accident in 2001). Patricia Ja Lee starred as Pink Power Ranger Cassie Chan during the late 1990s in Power Rangers Turbo, Power Rangers in Space and Power Rangers Lost Galaxy. Erika Fong starred as Mia Watanabe, another Pink Power Ranger, in Power Rangers Samurai from 2011-2012. While unclear if the superheroes were teenagers, the franchise is worth a mention by providing strong female Asian characters for nearly a decade. Ng was actually 22 when she played the teen detective Shelby Woo in this 1996-8 Nickelodeon show. Woo, who lives with her grandfather (played by Pat Morita) stumbles upon – and solves — unsolved mysteries while working as a police department clerk. Agena’s character Lane Kim in the CW family drama was one of the longest running TV portrayals of an Asian American teen, airing from 2000-7. While Agena was in her late 20s when the show began, her character, Lane, was a bespectacled 16-year-old drum-playing sidekick to Rory Gilmore. Much of Lane’s storyline focuses on the tensions with her demanding Korean American mother, who improbably runs an antique shop in tiny town of Stars Hollow, Connecticut. During the first two seasons, Asian American actor Eddie Shin was a frequent guest, playing Lane’s love interest Henry Cho. Lane’s story took a surprise turn in its final season, with a wedding and birth of twins. Already a recurring guest on many Disney Channel shows,17-year-old Song landed the role of spoiled heiress London Tipton in The Suite Life (2005-8) and its sequel the Suite Life on Deck (2008-11). While London’s Thai mother is never shown, one episode (“Family Thais”) features her finding out that her grandmother, played by Elizabeth Sung, is actually a poor rice farmer. Song also starred in the made for TV Disney movie Wendy Wu: Homecoming Warrior, playing a mall rat who answers her calling for Kung Fu greatness. The only two Asians in McKinley High musical theater, teen couple Mike and Tina (who both have Chang in their last names) earned nick-names like Chang squared. One of their most famous episodes storylines introduced the concept of the “Asian F” to primetime audiences. While the characters were high school students, Shum and Ushkowitz were both in their 20s when they took on the roles. Discovered after seeing a flyer for auditions at his martial arts studio, 15-year-old Ryan was cast in 2011 as Mike Fukunaga for two seasons of Nickelodeon’s Supah Ninjas. Guided by visions of his late grandfather, played by George Takei, Mike joins with two friends to form a crime-fighting ninja squad. At the age of two, Aubrey stepped into the role of Lily Tucker-Pritchett, the Vietnam-born daughter adopted by two dads, Mitchell and Cameron. In the six years that she’s been playing the role, Lily has charmed audiences, often by imitating the adults around her, such as dropping the F-bomb or announcing that she is gay, like her fathers. After playing a recurring character in the Diary of a Wimpy Kid movies, 11-year-old Brar landed the role of Ravi Ross, Disney channel’s first regular character of South Asian descent. Ravi was the adopted son of a wealthy New York family. Raised in Washington State, Brar speaks fluent English and worked with a dialect coach to perfect his Indian accent for the role. The show’s five-season run wrapped in October 2015. In 2014, Cho joined the cast of MTV’s werewolf drama as Kira Yukimura, the new girl in Beacon Hills. In the tradition of Asian TV characters with a mystical family history, Kira also happens to be a kitsune – a Japanese fox shape shifter. During Season Five, Kira engages in an epic knife fight with her mother. The grandson of Tibetan mountain climber Tenzing Norgay, the younger Tenzing became famous at age 12 in 2013 for playing Parker, the younger brother of the title characters of the Disney show. In an interview for the Disney Channel, Tenzing shows off the Tibetan heritage from his mother’s side of his family. 2015 ushered in a new crop of young Asian American talent. We have the new AMC series Into the Badlands, introducing us to Aramis Knight; the long-lasting Power Rangers franchise, featuring Yoshi Sudarso in Power Rangers Dino Charge; and two new ABC sitcoms, Fresh Off the Boat and Dr. Ken, introduced different perspectives, featuring a Taiwanese immigrant family and a second-generation Korean and Japanese American family. The teen of German, Indian and Pakistani background stars in AMC’s new dystopian martial arts show, Into the Badlands, as one of the leads, young MK, who has a secret—and special powers. Knight got his start in commercials and smaller roles in shows like Boston Legal and General Hospital. Formerly a stunt actor for the Power Rangers franchise, Sudarso finally gets his chance to show his face onscreen in 2015, as Koda the Blue Power Ranger. While the 26-year-old Sudarso is not a child, he merits a mention as the series has an enduring fanbase among youngsters, including those in Sudarso’s birthplace of Indonesia. The raw charisma of Hudson’s audition tape caught the eye of the real-life celebrity chef Eddie Huang, whose memoir inspired the sitcom. While a relative newcomer to show business, the 11-year-old was cast as young Eddie, who finds solace in hip hop as he navigates the world of middle school in an mostly-white Florida suburb. In contrast to Eddie’s budding teen angst, middle brother Emery, played by 11-year-old Forrest, possesses a laid-back vibe that effortlessly makes him the ladies’ man of the elementary school set. As youngest brother and mama’s boy Evan, Ian charms his parents – and TV audiences – with his bowl haircut and guileless smile. But the beginning of Season Two hints that even mommy’s little baby eventually grows up. A recent graduate of Carnegie Mellon University’s School of Drama, Krista plays sassy teenage daughter Molly on the ABC sitcom Dr. Ken. The storyline has featured the push-and-pull of Molly’s increasing independence, as she gets her driver’s license and even admits to taking a sip of beer at a party. 10-year-old Albert is Dave, the son of Dr. Ken Park, played by comedian Ken Jeong. If Albert looks familiar, maybe it’s because he also appeared as Phillip Goldstein during the first season of Fresh Off the Boat and a recurring role as Bert, the adopted son of Jackie and Pete on ABC’s Trophy Wife, which earned him a 2014 Critic’s Choice nomination for Best Supporting Actor. Grace Hwang Lynch is a San Francisco Bay Area freelance writer specializing in race, culture, and parenting. A former television news reporter, she still spends her days driving around in a van and waiting for things to happen. In the meantime, she blogs about Asian fusion family and food at HapaMama. This post is made possible by XFinity.